Candidates looking to renew their standard first aid certification can take this re-certification course. This first aid course is significantly shorter and cheaper than retaking the full course. 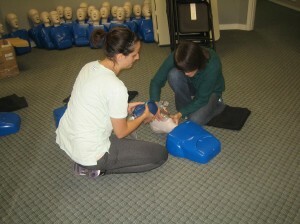 This renewal course also includes the standard CPR level “C” recert and includes AED certification. Other levels of CPR, including level “A” and “HCP”, can be substituted for CPR levell “C” at some locations. Upon successful completion of the course candidates receive a workplace approved certification card which is equivalent to a full course certificate. We strive to never cancel a course and to-date we have only cancelled less than 1% of our courses. We understand that maintaining your certification is important for you educational program or for your work so we try to never cancel a course. We also rarely cap our courses as we have the space and available instructors. Candidates will cover the same material as the standard first aid full course. The material will be presented in a condensed format and workplace approved instructor will focus on areas that candidates require improvement and on changes to standards. The length of the re-certification is approximately 6 to 8 hours and can be dependent on the skill and knowledge level of the candidates as well as the province in which the re-certification course is provided. The cost of the renewal course is approximately 70.00 dollars. Course cost includes workplace approved certification fee and all applicable taxes. We offer locations throughout Canada. To register, select the location nearest you by using our location page or by select from the locations featured in our side menu bar. Once you have completed selecting your location, you can register for a course and guarantee your spot in the class. Renewal courses are available throughout Canada including in Calgary, Edmonton, Vancouver, Surrey, Ottawa, Winnipeg, Regina and Saskatoon. We offer 100% full refunds to any registration as long as it is 72 hours before the course.